A pre-recorded streaming VIDEO replay of the December 2016 live seminar, The Rocket Docket: Trying Cases in the Eastern District of Virginia (RICHMOND PRESENTATION). It’s called “The Rocket Docket” for a reason! This long-running seminar is a must for any attorney practicing in the Eastern District of Virginia. During this program, you will hear from the judges that try your cases, and from some of the area’s finest litigators, as they discuss all relevant aspects of federal trial practice. Throughout the seminar, panelists offer insight and practice tips to help you achieve the optimum outcome for your clients. Highlighted clearly will be those rules and procedures unique to the Eastern District—those aspects that insiders know and follow, and that outsiders ignore at their grave peril. Experienced attorneys, as well as new attorneys, will benefit from the opportunity to learn the strategies that are most successful when trying cases in this court. Ask any of your colleagues who have practiced in the Eastern District: it is too late to learn the court’s rules once a case starts; you have to know them now. BONUS: The Virginia Lawyers Practice Handbook Federal Civil Practice in Virginia (2017 ed. 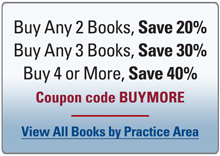 )—a $150 value—serves as the course materials in completely searchable electronic form.